A Miami Beach mansion in the Sunset Islands just hit the market for $19.9 million. 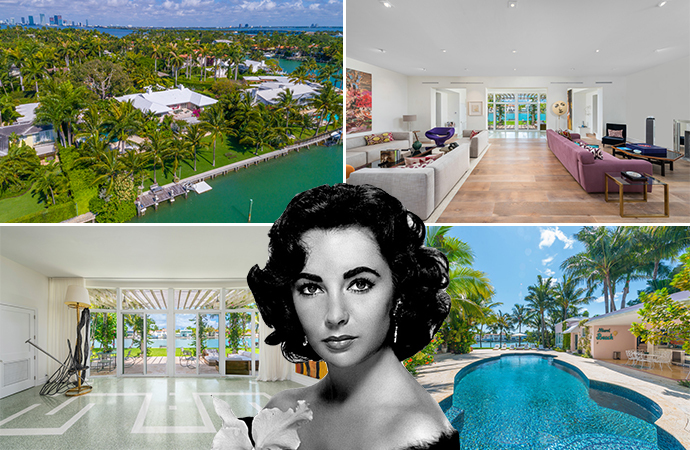 Elizabeth Taylor once lived in the waterfront property in the 1940s, when she was engaged to William Pawley, whose father developed the home. Now, owner 2555 Lake Avenue Home Owner LLC is putting the house at 2555 Lake Avenue on the market with Coldwell Banker’s The Jills. Records show the owner is controlled by Kaloyan Stoyanov with a Geneva address. Stoyanov is mentioned in the Panama Papers database. The owner paid $15.45 million for the 0.8-acre estate in 2013. Jill Hertzberg declined to comment on the owner, but said he is European and owns properties around the world. She was the listing agent when he purchased the home. It’s now on the market for about $2,166 per square foot. Pawley’s father, one of the islands’ original developers, built the home for himself, Hertzberg said. Most homes on Sunset Island 1 and Sunset Island 2 are on 20,000-square-foot lots, while 2555 Lake Avenue is on 35,100 square feet on the east side of Sunset Island 2. Last month, the creator of the South Beach Diet listed his custom-made estate at 1633 North View Drive in the Sunset Islands for $23 million, or $2,230 per square foot. The four man-made islands are west of North Bay Road and north of the Venetians. In March, a spec home at 1826 West 23rd Street on the Sunset Islands hit the market for $17.95 million, or nearly $2,500 per square foot. Earlier this year, a non-waterfront spec home on Sunset Island 3 sold for $5.8 million, or $1,130 per square foot.